Prostate adenocarcinoma is the second most frequent cancer worldwide and is one of the leading causes of male cancer-related deaths. However, it varies greatly in its behaviour, from indolent non-progressive disease to metastatic cancers with high associated mortality. The aim of this study was to identify predictive biomarkers for patients with localised prostate tumours most likely to progress to aggressive disease, to facilitate future tailored clinical treatment and identify novel therapeutic targets. The expression of 602 genes was profiled using oligoarrays, across three prostate cancer cell lines: CA-HPV-10, LNCaP and PC3, qualitatively identifying several potential prognostic biomarkers. Of particular interest was six transmembrane epithelial antigen of the prostate (STEAP) 1 and STEAP 2 which was subsequently analysed further in prostate cancer tissue samples following optimisation of an RNA extraction method from laser captured cells isolated from formalin-fixed paraffin-embedded biopsy samples. 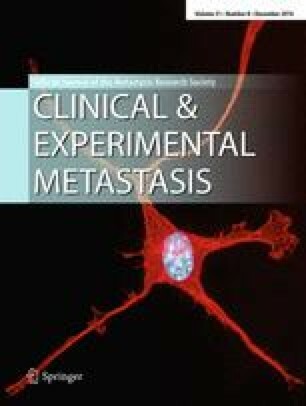 Quantitative analysis of STEAP1 and 2 gene expression were statistically significantly associated with the metastatic cell lines DU145 and PC3 as compared to the normal prostate epithelial cell line, PNT2. This expression pattern was also mirrored at the protein level in the cells. Furthermore, STEAP2 up-regulation was observed within a small patient cohort and was associated with those that had locally advanced disease. Subsequent mechanistic studies in the PNT2 cell line demonstrated that an over-expression of STEAP2 resulted in these normal prostate cells gaining an ability to migrate and invade, suggesting that STEAP2 expression may be a crucial molecule in driving the invasive ability of prostate cancer cells. The online version of this article (doi: 10.1007/s10585-014-9679-9) contains supplementary material, which is available to authorized users. Funding for this work was kindly provided by grants to SHD from the National Institute for Social Care and Health Research (NISCHR) and the Swansea Prostate Cancer Research Fund.